Affectionately known as Dub-a-Lub (he keeps his medicine name a secret), Dublin makes up for his giant size by being a general all-round easy going guy with an amazing sense of humour. He loves to drink coffee out of travel mugs, bonk you with his nose, make strange whale noises with his tongue, and insists on spilling half of his breakfast every day to share with Rosie. Dublin has been with Kera the longest, and is her main star in leading the therapeutic sessions. 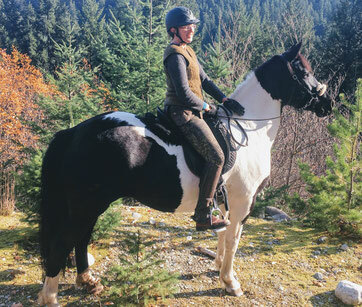 He can also take care of beginning riders, and teach adults the subtleties of awareness, intention and alignment. Sarah is the grandmother of the herd. 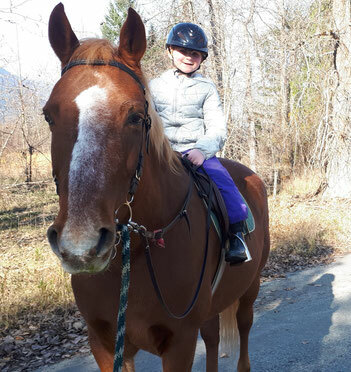 She worked as a trail horse for a long long time before coming to us at Mountain Horse. She is part in the dream world, part in this one, and has the tendency to fall asleep the minute her legs stop moving. But make no mistake- the dream world is where she gets her sweetness, huge heart and the generosity she gifts to us each day. 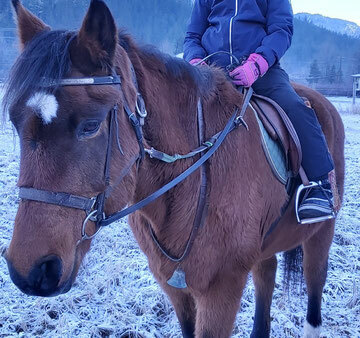 Rosie is the poster child of Mountain Horse School... the greeting committee and the free-range food cleaner upper. She pops out of her hay nest in the barn at the slightest noise, and loves if you get down really low, move slowly, and giver her a good belly or chin scratch. Or any kind of scratch. 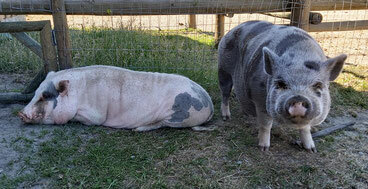 She flew out to BC in a pig crate, and arrived at the farm wearing a tiny pink tutu. Muscovies are a South American breed known for their sunny personalities and easy going natures. "The Duckadees" have many names and can be found swimming, flying and sunning themselves in their pen. If you can find a slug or worm while you are out at the farm, they would love to eat it for a snack. Vinnie came to us from an amazing woman who saved him and then kept him alive when he was a wee lamb. His mom rejected him and so he was raised by humans and his dog friends. When we saw Vinnie was looking for a new home we opened our barn doors- we just knew he would be a perfect fit. He is an absolute sweetheart, and invites us all to move slow enough when we are around him that he knows he can trust us, and teaches us that just a little more time is all that's needed to invite the special ones to come out of their shells.